Extending your Amarok music player to an audio file converter is a easy as installing a Firefox plugin. To do this you simply need to download the Audio Format Converter script. This free Python script converts audio file formats between FLAC, Ogg, MP3, MPC, M4A, and WAV. Run Amarok and move to Tools ->Script -> Script Manager and on the Script Manager window take Install Scripts and browse to where you downloaded the zipped .tar.bz and install. Audio Format Converter works in the background and depends on the already installed converting tools on your system. To make use of it goto the Script Manager -> General-> select formatconverter and click Run, you’ll be asked to select the directory where the converted files will be placed, the naming convention of the files and finally the audio format to which the files would be converted. A pop-up window will let you know the end of the conversion, in the meantime you could play your music. The transKode script could be better if you want to convert single files. 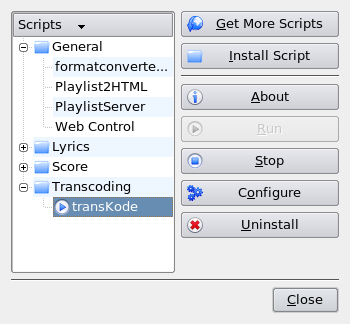 After having downloaded and installed it, you can further configure it from the Script Manager. File converting this time around is carried out in the playlists. Right-click the audio file you want to concert, from the menu, move to transKode and choose the file format you want.